Grain Company, Des Plaines, 111., the Conti-Betty Lynn is 160 feet long, 48 feet wide, 11 feet 6 inches deep, and is powered at 6,000 hp by two EMD engines. Lynn) Steinweg. Mr. Steinweg is senior vice president of Conti- nental Grain Company. The ves- sel was christened at the water- front in St. Louis, Mo. Petrobras, the Brazilian govern- ment oil agency. Products are developing a win- terized version of the RCV-150 for North Sea operations. The RCV-150 is equipped with a low-light-level video camera, a high-resolution search sonar, and a multifunction manipulator arm that can grip, maneuver, saw, brush and cut objects in waters up to 2,000 feet deep. The RCV-150 is housed in a submersible launcher that is low- ered from a ship into the sea. Once submerged, the vehicle trav- els under its own power, remain- ing attached to the launcher by an umbilical tether cable. An operator at the control con- sole topside maneuvers the RCV- 150 using a joy stick and steer- ing with the aid of sonar, video pictures, compass, depth gauges and other instruments. Sea Systems Command is the contracting activity. Hydro Products RCV-150, has be- gun work off Brazil. A current ABSTECH report proves Fluid Film® stands up to 91A years of continuous ballasting without rust damage or re-coating. 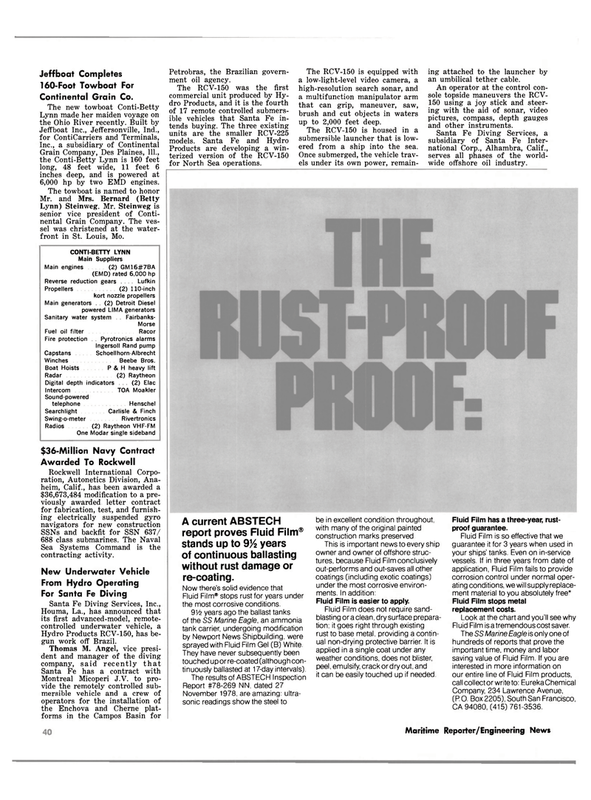 Fluid Film® stops rust for years under the most corrosive conditions. 91/2 years ago the ballast tanks of the SS Marine Eagle, an ammonia tank carrier, undergoing modification by Newport News Shipbuilding, were sprayed with Fluid Film Gel (B) White. They have never subsequently been touched upor re-coated (although con- tinuously ballasted at 17-day intervals). Fluid Film is easier to apply. Fluid Film does not require sand- blasting or a clean, dry surface prepara- tion; it goes right through existing rust to base metal, providing a contin- ual non-drying protective barrier. It is applied in a single coat under any weather conditions, does not blister, peel, emulsify, crackordry out, and it can be easily touched up if needed. Fluid Film has a three-year, rust- proof guarantee. Fluid Film stops metal replacement costs. Fluid Film is a tremendous cost saver.